It seems to get crazier every year. Some stores opened at midnight on “Black Friday,” others at 4 or 5 a.m. Wal Mart in some locations hired off-duty police officers for crowd control. At least this year no one was trampled to death by a mob of people anxious to get their hands on the best bargains like what happened a year ago. Of course, all the weekend after Thanksgiving sales, will be followed up with more enticing ads trying to convince us that blowing a wad of money proves how much we love someone. Am I the only one who finds this to be a very strange way to celebrate the birth of one born in the most humble of conditions? Jesus taught that “life does not consist of an abundance of positions,” yet many Americans have bought into the idea that the celebration of Christmas gives them permission to buy things they would never consider purchasing the remainder of the year. Now I’m not suggesting that anyone should adopt the idea that Christmas gifts for others should not be bought as a sign of religious piety. I am suggesting that we need to remember whose birthday we celebrate at Christmas. For the past couple of years here in New Sharon, and prior to that at the church I served in Sumner, I have encouraged my congregations to participate in what we call our “Christmas Miracle Offering.” The way the “Christmas Miracle Offering” works is simple. For every dollar you spend buying a gift for someone, you give an equal dollar amount to Jesus. In Matthew 25, Jesus teaches that what is done for the least of his brothers and sisters; the poor, the hungry, the oppressed, is done for him. Here in New Sharon we have seen Jesus through the eyes of SWIM (Safe Water International Ministries). SWIM provides safe drinking water and the living water of the gospel of Jesus Christ to the people of Nicaragua and other underdeveloped countries. Mahaska County’s own Greg and Vickie Stout provide the leadership and the hands on work for SWIM with the help of volunteers and one other full-time person in Nicaragua. You can learn more about their ministry at their website, www.swimforhim.net. Would you consider spending less on yourself and your family this Christmas so that a miracle can happen for someone else? Regardless of what your favorite charity is, you can be assured that they could use your financial assistance. A lot of people talk about keeping Christ in Christmas, by making helping to make miracles happen you can do more than just talk about it. It's Charge Conference time again, which means it's time to devise the annual church budget. There's few things I dislike more about being a pastor than having to come up with a new budget every year. I've always felt like budgets do more to restrain ministry than to promote it. Back when I served as a city council member in Pierson, I was part of the budgeting process for the city. According to state law, once something was budgeted the city was locked into that amount. It didn't matter if some item came in under budget and there was money in the account, those funds could not be used to address any other need that may have arisen. One of the problems I have with church budgets is how anyone to know where God might be moving in a some new way a year from now. How many opportunities have churches missed through the years because, "there's no money in the budget for that"? I have this strange belief that if God is calling the church to do something, God will provide the resources to make it possible regardless what the budget says. In our rapidly changing world, the church must be able to move quickly to meet the needs around it. Too often, rather than making that happen church budget inhibit that from happening. Another problem I have with church budgets is the fact that most every year of my 20+ years of ministry, the primary question centered around the budget is "how do we keep from spending any more money than is absolutely necessary?" Now I am profoundly aware that the money the church has comes as gifts from its members who rightly expect that their gifts will be used wisely. This is especially true during the difficult financial times we live in where many people's gifts are more sacrificial than during good times. However, I firmly believe that the problem lies not in the fact that the church is spending too much money, but the fact that people are not being obedient to God. The scriptures consistently speak of a tithe, 10% of one's income as the standard by which faithfulness is measured. Because so few people live out that standard the church is left to struggle and try to restrict spending money on ministry. Church budgets then end up addressing the symptom rather than the root cause of the problem. It's like a doctor prescribing a cough drop for someone who has pneumonia. The person's cough may disappear for a short while, but eventually it's going to return because the real disease hasn't been dealt with. I have never served a congregation where I thought that the budget was too high, that is not the real problem. It seems to me that if churches spent half as much energy teaching and encouraging people to financially support the work of the church as they do trying to control spending, trying to control spending would be rote. I'm praying for the day when all God's people act faithfully and the Church doesn't know what to do with all the money. IA UMC the next youtube?? United Methodist Churches & individuals in Iowa no longer have to look to youtube in order to put videos on line. The IA Conference recently added a video sharing feature to its website. This is made possible through an arrangement with ourchurchvideos.com. Members of the Iowa Conference are now encouraged to upload and share their ministry-related videos on this site....Channels include worship resources, missions, youth ministry, children's ministry, sermon and sermon series, and soon General Conference and Annual Conference. It will be interesting to see how many congregations take advantage of this service. We haven't started uploading videos. I probably need to find some high schooler who could do this for us. However, because we are a Web Empowered Church, showing FLV's is built into our web design software program. What's your opinion, if your Conference offered this service, would your congregation put videos on line? New Sharon UMC held their first ever Christmas Miracle Offering on December 23. I had invited the congregation to remember whose birthday Christmas celebrates and to give a gift to Jesus equal to amount they spent on buying gifts for others. Jesus was represented by the people who benefit from the ministry of Safe Water International Ministries. In one of God's mysterious ways, we had some friends stop by our house the day after Christmas. Barb told us about the experience her sister, a physicians assistant, had in Kenya a few months ago. Nancy was in Africa as part of a medical missionary team. While there were many cases of AIDS and other deadly diseases, the majority of the patients she treated came into the clinic because of a water-borne illness. That's not surprising since 50% of all the hospital beds in the world are occupied by people who became sick because they drank unsafe water. The vast majority of these cases and others like them around the world are easily prevented. 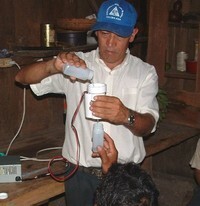 Safe Water International Ministries builds and delivers a simple devise which runs off a 12 volt battery. The choline producing unit (CPU) using table salt and a little water to make choline, an effective sanitizing element. The cost of each unit is $250. Here's where the Christmas Miracle is seen. Through the grace of God and the generosity of His people, the New Sharon UMC raised enough money to purchase 48 CPU's. In other words, that's $12,000 which individuals gave through a single offering to provide for the least of Jesus' brothers and sisters. Relatively speaking about amounts to nearly 5% of the congreation's annual budget. It's amazing what God can do when His people are called to faithfulness. If anyone reading this would like more information on SWIM or how the Christmas Miracle Offering was presented to the congregation, please contact me. Who knows what miracles God might have in store? 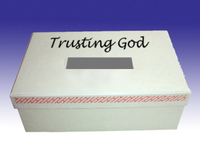 I borrowed an idea of a "Trusting God" box from Craig Groeschel the pastor of LifeChurch.tv for my sermon yesterday. Here's how he explains the concept in his book, Confessions of a Pastor. 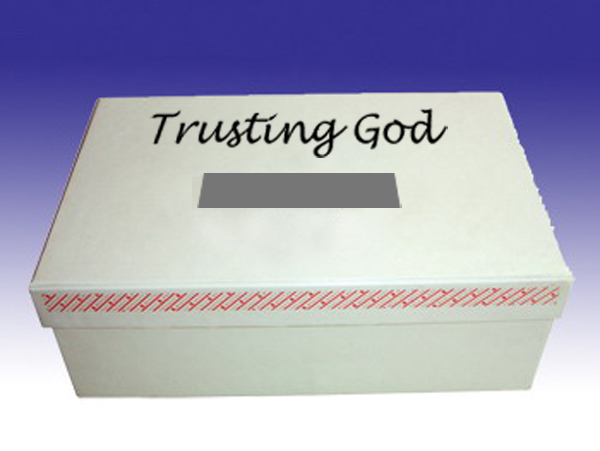 Find a box (or any other container) and write the words "Trusting God" on it. You might even get wild and call it your "Trusting God" box. Whenever you're worried about something you can't change, write your worry on a piece of paper and put it in the box. Once it's inside the box, it becomes God's property. His responsibility, not yours (it never was). From the moment you give your problem to Him, you're not allowed to worry about it. If you want to worry, then you have to go to the box and physically take the concern away from God. And when you do, you'll visually and physically act out what's really happening inside--you're choosing to stop trusting God. I made a "Trusting God" box and took it to worship with me. I preached on Matthew 6:25-34 and how we can overcome worry and fear. At the end of the message, the congregation were invited to write down a situation which was causing them to worry or be afraid and to bring it forward and place that situation into the "Trusting God" box which was on the altar before the cross. The response was amazing. At first people seemed hesitant to come forward, then one or two brave souls brought their worries before the Lord. That's all it took, it was like the floodgates opened and people were pouring out of their seats to put their fears in God's hands. God will Make a Way by Don Moen played in the background as people came forward. Tears filled many eyes as people let go of their burdens and trusted God with them. Afterward, one individual said to me, "We should do that every month." I think she has a point. We need to devise a way to give people the opportunity to unload their problems and to trust God to take care of them. I'm not sure exactly what that should look like, but it's an idea well worth exploring. Julie & I were introduced to a fantastic ministry last evening. Greg & Vicky Stout joined us for supper, then shared with us about their work for the Lord; Safe Water International Ministries. 20% of the world lacks access to safe water, that’s 1 Billion people! Contaminated water is responsible for diseases such as cholera, typhoid, malaria, schistosomiasis, hepatitis, diarrhea, and intestinal worms. 1.5 billion people suffer from parasitic worm infections. In China, India, and Indonesia twice as many people die from diarrhea than from HIV/AIDS. One flush on your toilet uses more water than the average person in a developing world uses in a whole day’s washing, cooking, and drinking. Greg and Vicky, who are members of my congregation have developed an amazing devise which using a 12 volt battery, ordinary table salt, and a little water creates chlorine which then can be added to a pail of water and kills the disease causing bacterias and parasites. They demonstrated the machine for us. In a matter of a couple of minutes they were able to make enough chlorine to treat 250 gallons of water. Most of Stout's ministry has taken place in Nicaragua, but they are branching out to other parts of the developing world. They recently traveled to Swaziland and some of their chlorine producing units are right now on the way to Kenya. I encourage you to check out their website and learn more about how they are bringing safe water to people in the name of Jesus Christ. I've always made visiting people in the hospital one of my priorities. But this week was crazy. On Tuesday morning, I drove to Iowa City to see a member who had be airlifted to the university hospital the night before. While traveling along Interstate 80, I was passed by an ambulance bearing another member who was being transferred there. I immediately checked in at the emergency room when I got there and spend time with the patient and her mother until other family arrived. I then went upstairs to be with the other member and his family. I got back home about 1:00 p.m. Eight hours later, I was back in the car headed to Iowa City again. This time to meet our son Josh there. While playing softball in the rain, a bat slipped out of his best friend's hands and had hit him in the face breaking his jaw. By the time we had seen 4 or 5 residents in the ER, and they had taken xrays, it was 4 a.m. when we arrived back home. Wednesday noon I called my parents to let them know what happened and found out that my dad was in the hospital because his blood pressure skyrocketed. He's doing ok now. Thanks be to God. Yesterday, it was back to IC for the third time in three days. This time so that Josh could have a plate put in and his mouth wired shut. While we were in the pre-op room, a friend of ours & his wife came in. He was having prostate surgery. While Josh was in the operating room, I stopped to see a pastor friend of mine whose daughter was undergoing some tests on her liver. I also checked in with the families of the two members of my congregation. This morning it was off to Des Moines with stops at Mercy and Lutheran hospitals. I've spent the afternoon at home working on my sermon and taking care of Josh. He's doing amazing well, though he still in quite a bit of pain. In fact, I have to wrap this up so I can puree some homemade chicken & noodle soup for him. Please keep Josh in your prayers.